She was born in 2341, on stardate 23634.1, on Trill. Growing up, Jadzia was always a shy and quiet child. She lived with her mother, father and sister on Trill and was always very driven by her ambitions to one day be joined to a symbiont. She spent much of her early life focusing on achieving her goals. She was the only member of her family who would ever become joined to a symbiont. Prior to her joining, Jadzia attended Starfleet Academy and applied to the Trill Symbiosis Commission for joining after graduation. While at the Academy, she earned Premier Distinctions in astrophysics, exoarchaeology, exobiology and zoology. After working hard, Jadzia was initially rejected for joining and eliminated from the program by her field docent Curzon Dax in 2364. The reason he gave for this decision was that Jadzia lacked purpose. After Curzon's initial decision, she successfully re-applied that same year and became the only Trill in history to successfully complete the program after having been rejected. She described herself as going as a "different woman" into the program and "tore through it with a passion." The experience of her initial rejection would haunt her for years to come and was one reason why she never had positive feelings about returning to Trill. She never could understand why she was washed out of the program by Curzon. She was joined to Dax in 2367 after the death of Curzon. After being approved for joining, she had heard of Curzon's deteriorating health and requested that she receive the Dax symbiont after Curzon's death. Later, during her zhian'tara, she learned that Curzon's reasons for rejecting her original application were personal, since he had actually fallen in love with her. After being joined to Dax, Jadzia's training and experiences made the adjustment to having seven different lifetimes of memories and experiences relatively easy. The once shy, hardworking and dedicated Jadzia became a lively, confident and outgoing person with a passion for life. Jadzia was very comfortable with who she was. She was later described by Garak as "vital, alive… she owned herself." After joining, Jadzia picked up on the habits of her previous hosts, such as clasping her hands behind her back, taking up Klingon martial arts, an interest in Klingon culture or playing tongo. Even as an ensign and lieutenant jg in Starfleet, she had dealings with many prominent officers. She was acquainted with Captain Keogh, though the two did not get along. She was also friends with Captain Shelby, who even owed her a favor, which Jadzia eventually cashed in. In 2369, twenty-eight-year-old Lieutenant Jadzia Dax was assigned as science officer aboard Deep Space 9, under the command of Benjamin Sisko, who had been a friend of Curzon. Shortly after her assignment to the station, Jadzia and Sisko discovered the Bajoran wormhole, opening a new era in Federation history. Later that year Jadzia stood trial for crimes that Curzon had allegedly committed during the Klaestron Civil War. Though she was ultimately cleared of the charges, Jadzia had been willing to accept a guilty verdict in order to protect the honor of Curzon and Enina Tandro. In 2370, the Dax symbiont was removed from Jadzia and kidnapped by an unjoined Trill, Verad, who believed he had been cheated of being joined. He was briefly joined with the Dax symbiont, becoming Verad Dax before he was apprehended and Dax was rejoined with Jadzia. After she was rejoined with the symbiont, Verad's memories – cold and afraid – stayed with her for the rest of her life. After landing on a planet in the Gamma Quadrant, Jadzia and Odo tried to solve a mystery. The people of the village were disappearing. They discovered that the people were holograms, created by Rurigan, whose village was wiped out by the Jem'Hadar. The hologenerator was malfunctioning, but they were able to fix it and bring the people back. That same year, Jadzia took on the role that had caused her so much pain before, that of field docent for the Trill Symbiosis Commission. Her initiate, Arjin, boarded Deep Space 9 with a great deal of apprehension because of the legendary harshness of Dax as a field docent. Jadzia, however, was determined not to be the same kind of docent that Curzon had been and made every effort to convince Arjin of this. Jadzia kept an oath made by Curzon with his Klingon brothers. His friends' sons had been killed by the Albino, a master criminal, against whom the four vowed vengeance. At first, they were reluctant to accept her into their group, but she successfully persuaded them. She participated in the attack that killed the Albino; however, two of the three Klingons were also killed. 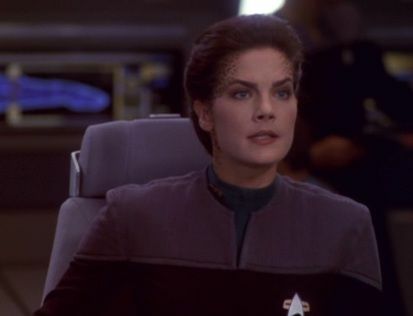 Jadzia was threatened with the removal of Dax a second time in 2371, when it was discovered that a previously undisclosed host, Joran Belar, had been psychotic. This previously unknown host was a skilled musician who had had a violent temper and killed people; including the doctor who recommended that he be dropped from the program. Jadzia had unknowingly began to manifest some of Joran's musical talents. The Trill Symbiosis Commission had kept the memories of Joran blocked from both symbiont and host, but they began to resurface and threatened to cause Jadzia to reject Dax. Doctor Bashir then recommended that he and Commander Sisko take Dax back to Trill for treatment from the doctors of the Symbiosis Commission as Doctor Bashir's knowledge of Trill biology; specifically symbiosis was limited. Subsequent investigations by Commander Sisko and Doctor Bashir uncovered the existence of Joran Dax. Under threat of exposing their great secret – that one in two Trill were capable of joining, not the generally believed one in ten thousand – the Commission agreed to restore Joran's memories by allowing the memories to completely surface and reintegrate into her mind, which ultimately equalized the symbiosis and saved Jadzia's life. In 2371, she was transported back in time to the era of the Bell Riots, an event which caused social upheaval and awareness of the plight of the poor. While Sisko and Bashir were trapped in a Sanctuary District, Dax was befriended by a wealthy businessman named Christopher Brynner who took her in under the assumption that she had been mugged. Jadzia and Christopher quickly became friends. She accompanied him to a business function. Subsequently, she convinced him to allow the impoverished residents to speak out on his television network. It is worth noting that during her time in this time period, Dax was able to successfully breach the local computer systems and successfully procure legitimate identification, internet logon credentials and credit cards to better blend into the environment. Consequently, she was able to contact the crew of the USS Defiant, who were able to return them to their own timeline, with only a few minor changes. Shortly after Commander Sisko was promoted to Captain Dax herself was promoted to Lieutenant Commander. An accident caused her to be stuck on Prometheus when it was forced to slide from her quantum reality. After arriving in the home quantum reality of the Prometheus she was assigned to the newly commissioned USS Saratoga serving as it's Chief Science Officer and Second Officer for almost seven years before getting promoted to be the Odyssey First Officer. While serving on the Saratoga Jadzia became close friends with Security Chief Killingsly even recommending that he come to Odyssey as it's Second Officer. After hearing about the death of her quantum reality double indigenous to the quantum reality she was now in Jadzia went out of her way to avoid Deep Space Nine and it's crew specifically Worf. It wasn't until 2379 that she finally went to Bajor to see Captain Sisko and his new family. Dax was very uncomfortable when she was told to wait for the Odyssey on Deep Space Nine.